The world's thinnest tourbillon gets stripped back and exposed, showcasing in captivating contemporary fashion a monochrome mechanical marvel, and its stunning array in a slippery ultra-flat signature case of brushed and polished platinum. In this company of six pre-selected finalists in the 2017 GPHG Tourbillon and Escapement category, or indeed in any company, the Bulgari Octo Finissimo Tourbillon Skeleton stands out. At a mere 5mm thin it is visually unusual, as it's little thicker than a couple of average coins, and so extremely slight on the wrist. But even so, with the contemporary architecture of the exposed movement and its interlocking gears and that flying tourbillon, it still packs enormous presence. The Octo Finissimo in its multi-faceted platinum case features a pair of flat sapphire crystals, and with no dial, its proportions are already significantly reduced. Add to that the striking two-tone contrast, and the fascinating spread of its leaf-thin silvery mechanics on a matte black base, and the Tourbillon Skeleton takes on a brooding avant-garde appearance. 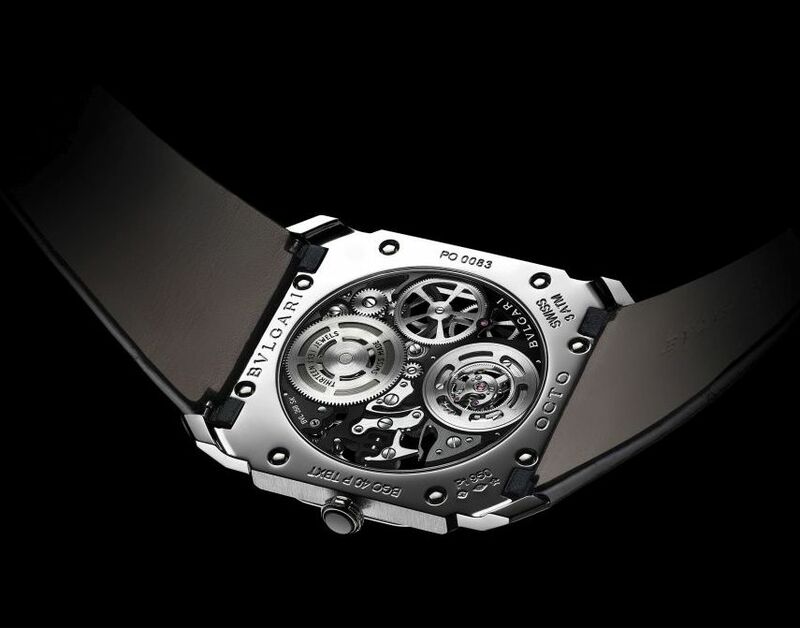 Of the six contestants, only the Royal Oak Offshore Tourbillon Chronograph by Audemars Piguet share its radical modernity. The hand winding movement itself is not new, having been introduced in the Octo Finissimo Tourbillon in 2014, when it set the world record for thinnest tourbillon at only 1.95mm, and also made it through to the final pre-selection. A construction which demanded new thinking, to minimise its dimensions, bridges were dispensed with and rolling ball bearing races were used extensively instead of rubies, and in this remarkable skeletonised form all of its complex secrets are laid bare. It's both visually and technically spectacular, and it is surely a contender for honours here, but will it win? From a purely horological perspective, and the alluring fascination of naked mechanics the Bulgari Octo Finissimo Tourbillon Skeleton could well win the Aiguille. However, I will stop short of saying that it will.